Merry Christmas! The day has finally arrived and I'll be brief since I know many of you will be busy with family and friends today. I do pray that this is a day touched by joy for each of you. I know Christmas is not a happy day for all, but I know that even in grief, pain, and sorrow the Lord can wrap us in His peace and hope. I am praying for you all as I write. Over the course of Advent, I have been following a few reading plans and on this final 'Interacting with Christmas' Thursday, I want to share with you something that has stood out to me. Do you know of Zechariah, Simeon, and Anna? You can read their stories in the early chapters of Luke. They not only believed in God, but they held Him to is promises and spent time in worship and prayer asking the Lord to bring consolation to Israel, to bring the Light of salvation. Yesterday I was reading a short reflection on Mary by Martin Luther and as he was talking about what Mary might have been doing when the angel came to her to announce that she would be the mother of God. 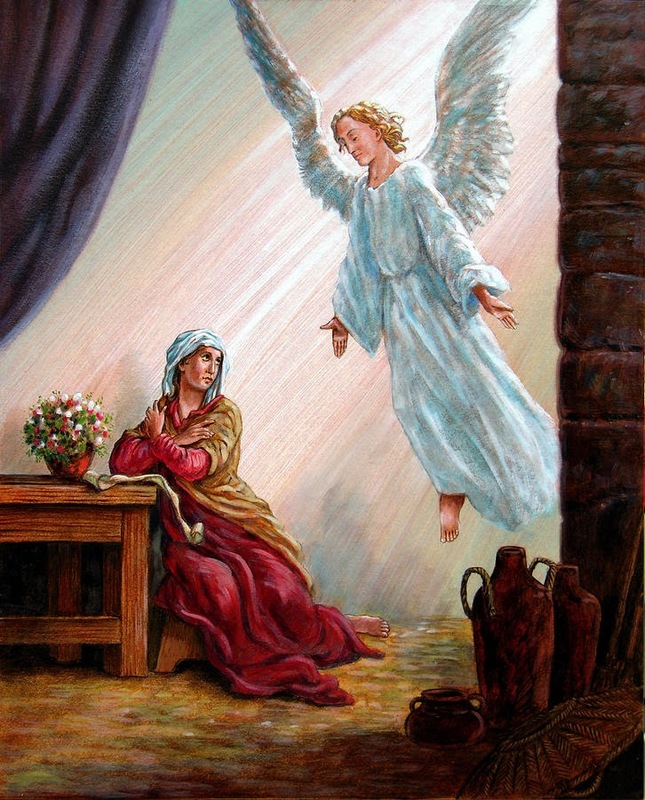 He said, Quite possibly Mary was doing housework when the angel Gabriel came to her. Angels prefer to come to people as they are fulfilling their calling and discharging their office. ... Possibly, however, the Virgin Mary, who was very religious, was in a corner praying for the redemption of Israel. During prayer, also, the angels are wont to appear. Again, I was prompted to meditate on how much the people of Israel longed and prayed for the coming Messiah. We have the blessed privilege of knowing the whole story of Jesus' earthly life! It is the best news a person can hear and embrace. The Light has come into the darkness and prisoners can be set free. Hallelujah!! In short, Jesus is coming back! We know the Lord's salvation, but we are not yet with Him forever. We still struggle daily against the world, the flesh, and the devil. We can join Zechariah, Simeon, Anna, and Mary in anticipation and longing, not for our Savior's arrival, but for His return, our day to join Him in glory. God started making promises to His people in the Garden of Eden. So far, He has fulfilled all of them. Let us be found longing for and anticipating His return when the final promise comes to pass! Christmas is only the beginning Jump on board the A & L - anticipation and longing - train, because our Lord who came first as a baby will come again, riding on the clouds, in His full glory as King of kings and Lord of lords! *Sorry I missed Tradition Tuesday this week. We were already with family and I decided not to make the time. Leaves something for next year!